We spent 1 week there it was good. There are plenty of things to do in the area. Isabel is a very nice and reliable person. The apartment is ok and tidy. There is a washing machine which is convenient for the laundry ! The only down size is that the double bed is definitely too small and not comfy for 2 adults but I guess this can easily be changed. The weather was not kind to us during our week's holiday but it was nice to return to our cosy retreat at the end of the day. The apartment is set in a very quiet, elevated spot, with views to open countryside in all directions. It is in quite a remote spot about 7km from Zarautz and a similar distance from Zumaia,.so a car is essential. The owner Isabel was there to greet us and made us feel very welcome. She was also very helpful when we had trouble with our hire car. The apartment is comfortably furnished with a very light and airy living area. The second bedroom is a little small for two adults but we managed. There is a lovely terrace but unfortunately the weather didn't allow us to make use of it. Thank you Isabel for welcoming us into your apartment. "A quiet place to stay and explore the basque coast from Bilbao to Hondaribbia and Nervion's Gorges to Tolosa. The owner is an artist and lives downstairs; she is charming and very helpful." We had a very nice stay in this appartment. The location of the house is excellent: nearby lots of nice beaches, villages/cities and surrounded by green hills and vineyards. The house itself is provided with everything you need. The terrace is big, and sunny from the early morning till the evening. There's also a lounge bed, which we liked a lot for some relaxing. Isabel is a lovely host (and also is her sister Elena, who welcomed us at arrival). Isabel provided us with suggestions for nice restaurants and things to do. On top of that, she gave us a delicious bottle of wine and beautiful fresh flowers from her garden. 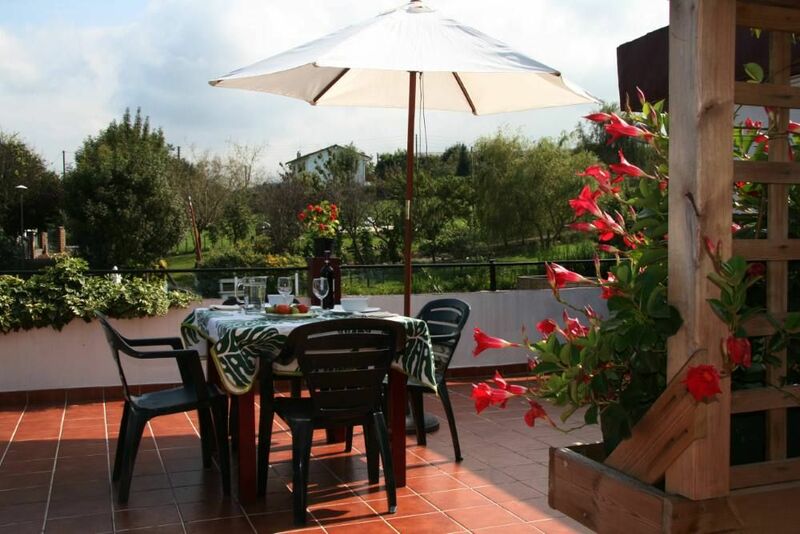 We'd really recommend this appartment to everyone who likes to discover Basque Country and want to enjoy beautiful nature, peace and beaches. Een huis met alle comfort, maar dat het echt rustig gelegen is kunnen wij niet zeggen. Er is te weinig privacy (op het privé-balkon is de hoofdingang van de ernaast gelegen woning). Bovendien lopen er twee regelmatig blaffende honden los rondom het huis (van buren twee huizen verder). Wie bang is voor honden moet hier niet naar toe gaan. Maar op het huis zelf is niets aan te merken en de ligging t.o.v. de bezienswaardigheden is uitstekend. AP8: Exit 11 (Zarautz). 2nd roundabout turn left. Crossing Zarautz and end, next to a church, turn left towards the GI-2633 Airzanazabal. From the Hotel Azkue, address Areta, the third road on the left: URTEAGA Berri.